I have OCD when it comes to checking AdMob and Android Market Developer Console statistics. I’m probably not alone on this one either. Lately, I get a bit under a thousand new users each day. Over the past 7 months over 50% of my users are still with me! Wahoo! However, an irregularity has popped up over the last six days. In this particular case, the # of installs of one my apps, Hoversweeper, has totally flat-lined to just a handful per day. 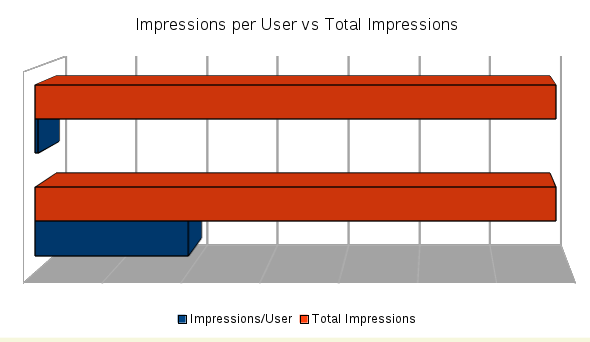 But the AdMob ad impressions haven’t! There are minor fluctuations (standard day of the week stuff), but it has been growing on average 8% from the previous day. Just with respect to AdMob, I don’t really care if an average user plays 21 times or over 1000. All I care about is that the # of impressions are accurate. But I think the former assessment for # of plays per user is a little more realistic. However the stats in the Developer Console have affected my ratings in the Brain & Puzzles Top New Free section. I fell from #30 to #88! As a very rough estimate, I think my position in the Top New Free section was giving me a 20% boost. (I *just* disappeared from the Top New Free section today as it’s been a month since publishing, so I’m basing that just on today’s stats.) This will also negatively affect my ranking in the Android Market for ‘minesweeper’ searches if it keeps up. This entry was posted on 2011.11.24, 11:28 and is filed under admob, android, android market. You can follow any responses to this entry through RSS 2.0. Both comments and pings are currently closed.